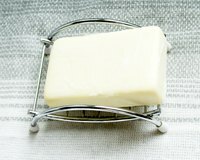 Lard soap is a traditional favorite because it makes for hard, long-lasting bar of soap that cleans well and won't dry out the skin. Whether you use lard from your grocery store or sourced from a local farm, the process for mixing it with lye to create your own soap is the same. The following tutorial will yield about two pounds (about 10 bars) of Lye Soap with Lard. Tip: A good rule for soap making is that once a tool has touched lye, it should not be used again for food. Step 1 Measure out the water and add to mixing container. Step 2 Weigh out lye and add to water. Use a lye calculator to make sure all you use the right amount of lye! Too much lye can bother your skin. Step 3 Mix until the lye is completely dissolved. Stir lye into water at arms length to avoid inhaling the fumes. The reaction of the lye with the water will heat the solution up to about 180 degrees. Step 4 Set the lye solution aside in a safe place and allow to cool to room temperature or below 100 degrees. Always observe proper safety precautions when working with lye by wearing gloves and safety goggles. Always add lye to the water, never water to the lye! In the Microwave Weigh out the lard and place in microwave safe bowl. Melt on high for one minute. Stir thoroughly and repeat until completely melted. On the Stove Top Place in saucepan on stove top over medium-low heat, stirring occasionally until completely melted. Pour melted lard into large stainless steel bowl and allow to cool to room temperature or below 100 degrees. Note: This recipe was calculated with 5% more lard than was needed to absorb all of the lye. Not only does this add moisturizing properties to your soap, it makes sure there is no lye that didn't turn into soap. Step 1 Wearing your gloves and goggles, add your lye solution to the lard. Step 2 With hand blender, alternate pulsing and stirring the mixture, working carefully not to create air bubbles until solution reaches trace. Trace is the point at which the lye has all been saponified, or turned into soap. You will know you've reached trace when your mixture has a thick, pudding-like texture. Step 3 Once you've reached trace, add your fragrance and mix throughout. Some fragrance will accelerate trace, so it's sometimes better to stir in fragrance with a spoon rather then the hand blender to give you more time to work. Pour soap mixture into mold and cover with plastic wrap. Wrap in old towel to hold heat in and put in safe place and allow soap to harden for at least 24 hours. Step 1 After 24 hours, unwrap mold and turn upside down, pressing softly on the underside of mold to slide loaf out. Step 2 Cut into bars about 1-inch wide using soap cutter or sharp kitchen knife. Step 3 Place bars on a shelf with air flow to cure for at least 3 weeks before use. Tip: For a longer-lasting bar, allow soap to cure for at least 6 weeks.